Product categories of Food Processors, we are specialized manufacturers from China, Food Processors, Electric Food Processor suppliers/factory, wholesale high-quality products of Mini Food Processor R & D and manufacturing, we have the perfect after-sales service and technical support. Look forward to your cooperation! Food Processors are multifunction kitchen appliances that can process food, vegetables into various desired states by matching different accessories. 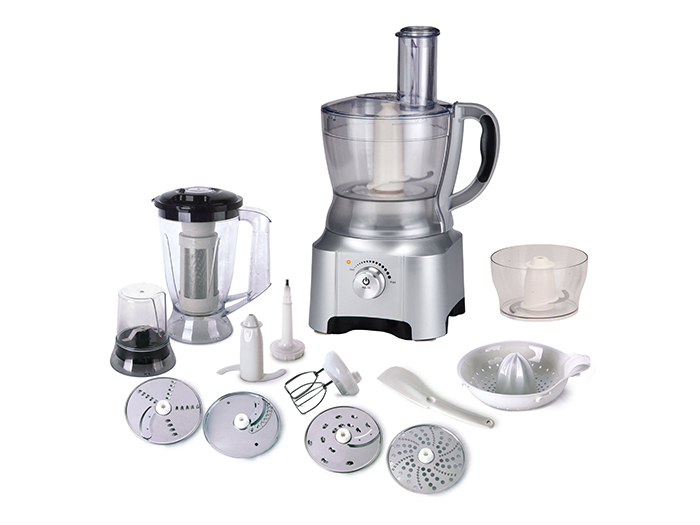 The more accessories, the more function of the food processors have. Usually, food processors including Plastic Jar Food Processors and Glass Jar Food Processors. According to the function, food processors can be divided into 4 in 1, 7 in 1, 10 in 1 and 15 in 1 food processors. Generally speaking, food processors have the following functions: Blender, Juicer, Filter, Grinder, Mixing, Chopping, Citrus, Dough making, Egg whisk, Slice, Shred, Mash, Frech fries making, etc.